Bathroom Design….I need your help! Okay, so as you know the husband and I are in the process of remodeling our bathroom. We finally made it out to the tile shop yesterday. Most of these places close at 5:00 and are only open a few hours on Saturday….which has made things take a little longer. Here is my design inspiration. I love this bathroom! The floor is gorgeous, but crazy expensive. And here is the tile I selected! I’m so excited about it. The piece on the left is marble for the floor (but will be 12×12) and the white subway tile is for the shower (actual size is shown). It was so awesome to be able to walk into the shop and actually see the two tiles together. And of course it also helped that the design guy working with us loved my ideas! 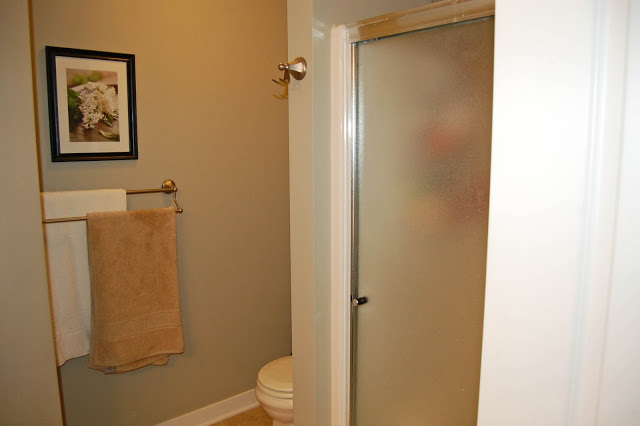 Next we have to go to a glass shop to pick out an all glass European enclosure for the shower. We also have to pick out a counter top….and here is where I need your help! Here is our current bathroom. The big ugly mirror is coming down and will be replaced by two smaller mirrors. Now, what should I do with the counter top? Would it look to weird/matchy matchy to do a marble similar to the tile floor? The husband thinks we should do something black on the counter…but I think it would be a pain to keep clean. Between the dog and cat hair we have everywhere and little drips of water from the sink I am afraid every little thing will show. So I would prefer something lighter. If we did do a white/light counter top would it be too much white if we paint the cabinets white too? Should they be black? I just can’t decide! I think we are going to paint the walls some shade of blue….haven’t decided yet! 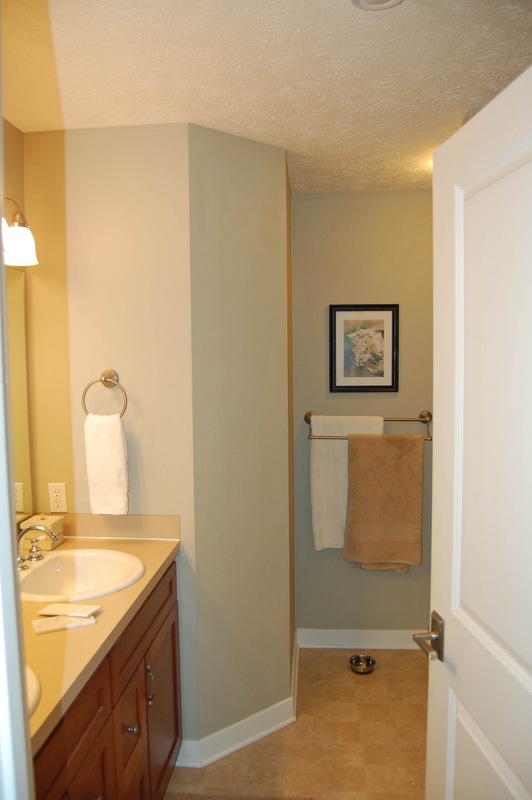 I also wanted to do beadboard in here but I think we are going to pass on that for now…we can always add it later. So I need your help….any ideas/recommendations? if i were you i would do a white counter top and paint the cabinets black, and a light colour on the walls..the bathroom you inspire from is bigger and doesn't have an wall in the corner loke yours does. so it would make the impression of a bigger bath if the walls were in a light colour..:D hope it's useful what i just said..kisses. before I say my idea I have to say that I have zero design experience or creativity. What if you did a lighter shade of black (like a dark slate or gray-ish) color on the counter top? I completely understand what you mean about keeping black clean – it would be hard. But your design inspiration's counter has a little bit of a marble/swirl counter with some grays in it. Like I said, I have NO idea, but maybe you could find something that could be somewhat a "meet in the middle" for you and your husband? Do you like the contract of the dark wood in your inspiration photo? If so, then totally paint or stain the cabinets. I would do light counter tops. I HATE toothpaste spots and just think how much more obvious they would be…. Maybe put your inspiration photo in in "paint" or photoshop and white out the cabinets and see if you still like. I love all white but sometimes the thought of fingerprints gets to me. My lightswitch in my bathroom is constantly scrubbed so I wonder if the area around the cabinet hardware would get filthy. Plus, all white may look/feel a bit sterile. Just thoughts. Love the inspiration photo! Hey Chica! Send me your email, I have something to send you concerning your bathroom!! I am HORRIBLE with decor but I'd say a light countertop and paint the cabinets darker. Just my 2 cents. I'm actually going through the same thing in my bathroom RIGHT NOW! Hmmm, I think you could do marble countertops, or even just "plain" white. I'd say keep it simple because that is the part that will get beat up with drips, toothpaste, etc. I love your inspiration photograph! As somone who has a black granite bathroom countertop – DON'T DO IT! Every water spot shows, as does dust, just like you said. I think the same marble you're doing on the floor would look great. And I like the idea of doing it with the white cabinets. You'll have color on the walls and you can't have too much white, in my opinion. I think it will turn out gorgeous! I like the idea of a chocolate or black cabinet base, with a marble colored counter. 🙂 It's going to look so good!!! NO BLACK! I second Erin's ideas. Because she's my sister seperated by birth in Canada. But I echo everything she says. check out http://www.designinc.ca – Sarah is one of my favorite designers and I think you'd like her design elements. 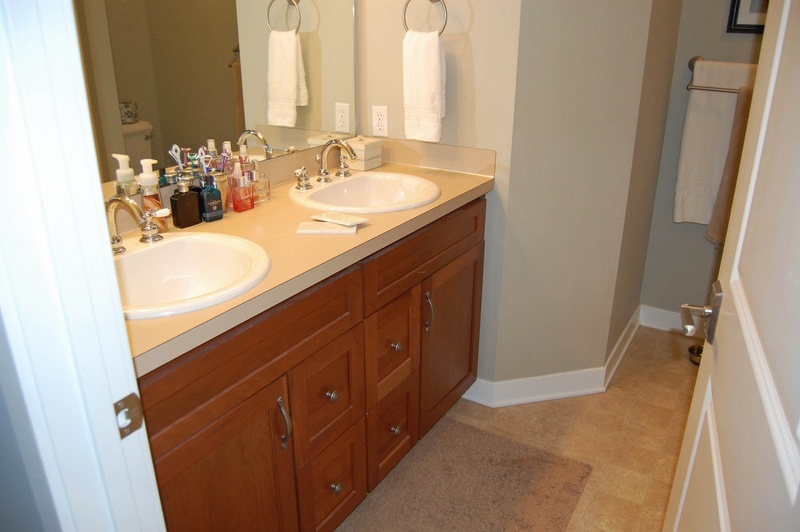 She has some baths with dark cabinets and light counter tops and lighter cabinets with lighter countertops. I would stay far away from a dark counter top – way too hard to keep clean. We did a subway tile on the counter and in the shower and I really like the look! And all you need to keep them clean is a little bleach from time to time. 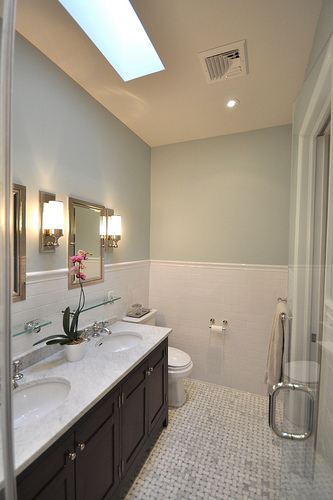 I think the bathroom is going to look amazing…whatever you decide! I agree with the no black. I think it would be hard to keep clean, especially for toothpaste. I love all the other choices though! Awesome inspiration picture! Here's my advice- first, I love the marble and subway tiles! 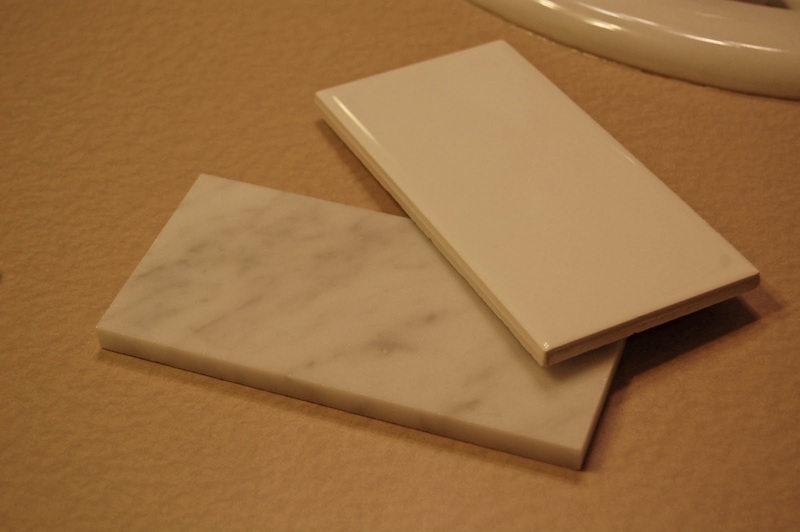 Suggestion for the counter is definitely something lighter, but NOT marble! I just learned in my materials class in design school that marble will patina(fancy word for stain) with water and you'll also be able to see the water marks a lot easier. I'd go with a quartz or granite slab (: Blue for the walls seems great! If you like the basketweave tile on the floor, you can get it on ebay for $10 sq. ft. we are redoing our bathroom with almost the exact same inspiration picture. We ordered the basketweave tile off of ebay and it is awesome! I think black granite specifically tends to look streaky and doesn't show as well. Plus, it's so abrasive to walk into a light room and have a black countertop. I agree with those who said a light color, maybe even a gray to pick up on the gray in the marble floor. I do, however, admit that design is not my biggest strength.